Keyword research and analysis: Perhaps the most boring and dreaded task in search marketing, keyword research can quickly overwhelm fledgling SEOs. I look at basic search and user behavior, in addition to your high converting and competitive keywords. Competitive analysis: Are you neck and neck with the competition and need to know exactly what they’re doing and how? You need to learn about their keyword usage, ranking and backlinks – all important in order to develop SEO strategies to compete. And win. Link building audit: Have you outsourced your link building and don’t know if something is hurting or helping? Are you new to the space and just need links, period? I can review your old links and build a custom strategy for quality link acquisition. Link building: Need natural, high quality links? Don’t put your link building efforts on auto-pilot. Instead, I carefully craft pitches, content and submissions with your brand and long-term success in mind. If you don’t have sufficient linkable content or on-page optimization, I’ll work with you to bring the quality of the site up to professional standards for link building. Redesign guidance: Does your site rank competitively and now you’re afraid to redesign because of the possibility of losing your placement? I’ll create a strategy for the redesign and work with your development team to help ensure little or no negative impact when you take the leap. SEO Outsource – All or Just Part? My search engine optimization services can take you from start to finish. Or, you can do some of it yourself, coordinated with my services. 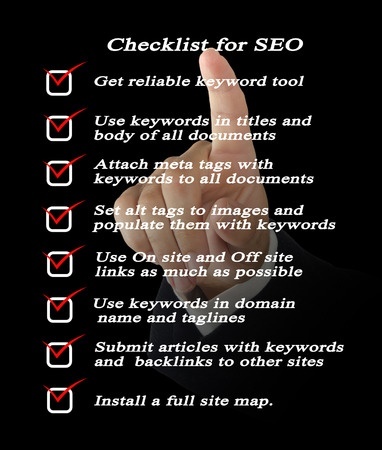 I can do everything – the research, SEO strategy, SEO plan and execution. Or you can do as much as possible under my direction. It’s up to you and your available resources, both human and financial. Either way, I’ll work with you to create a strategy that makes sense, help you understand where your competitors are, survey your link structure and show you which keywords are most important to target and achieve success. Consultation: In the initial meeting we discuss your business, your products and services, competitors and your target market. After we agree on terms, I go back to my office and begin the SEO Analysis on your site – asking questions along the way to ensure that I’m on track and stay there. Website Analysis: Evaluate your site structure, page meta-data, keyword density, linking specifics and other factors critical to SEO success. Keyword Research: Assess the competitiveness of the keywords related to your business offerings and develop a cost-effective strategy to target search phrases that will bring business to your door. Link Analysis: Links are still important, and Google will continue to place emphasis on links in its search algorithm. In this video, Google engineer Matt Cutts discusses the relative importance of a site’s ‘backlinks’. Content Inventory: In addition to website Analysis, Keyword Research and Link Analysis, a detailed SEO Analysis also includes a thorough inventory of your available content, as well as a strategic review of competitors’ content. All with the goal of out-ranking and out-shining your competitors, using content as search candy. Roadmap Creation: Create a detailed roadmap that outlines the activities to be completed over the coming months. Execution: We complete the tasks in the roadmap, working with you to get necessary changes to your site implemented. If you’re not using strategic SEO to get your website ranked, well, you’re already behind. Give me a call. Or drop an email. We can talk about your specific situation and needs.